There is a popular saying that transcends any culture and sees the face as “the mirror of the soul”, the Chinese tradition is able to read the face and tell you how healthy you are; the Ayurvedic, Indian tradition, as well believe that the face acts as a window revealing the health of the body; in the Western culture we have a good example with a quotation from Coco Chanel who said “We get the faces we deserve” believing our life creates our appearance. There is a great deal put into discovering the secret of the eternal youth, but the most of us know that getting old is a natural process which may be accelerated or slowed down. Inappropriate diet (for example excess salt or sugar intake), persistent negative emotions, habitual expressions, unhealthy lifestyle choices (like legal or illegal drugs, alcohol, smoke consumption…), sunbathing, lack of water consumption, toxins, poor skin care routine, sleeplessness and stress are some of the well known contributors to lines, congestion and colours on the face. On the other hand we see how beauty is wrongly linked to youth but, as we get older we are more likely to realize how beauty and attractiveness occur at all stages in our life. You might notice how some people look more attractive as they get mature, may be their greater confidence, peace of mind and soul, their practice of regular and gentle exercise, healthier diet, bodywork and massage practice, social life, wiser management of emotion and personal time… etc. The way we feel is shown off in our faces as the influences of the outside world affect us as well our whole body and appearance, there is no way to un-link this. Today, we can add a new positive factor to rejuvenate your face, this is a specific massage that works out your muscles and facial skin. Natural Facial Lift Rejuvenation Massage helps you to feel good inwards and outwardly. This is a new hands-on technique, natural, non-invasive and non-surgical health care modality. The unique movements help to banish wrinkles and lift your face. This treatment not only helps you to reverse many adverse effects to your skin but also can go a long way to delaying or preventing further damage in the future. 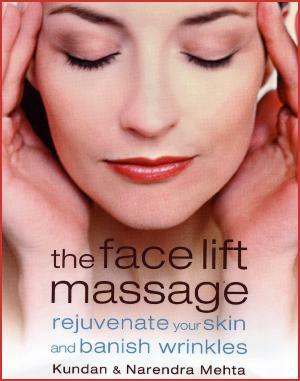 As If that was not enough, a face-lift massage can leave you feeling relaxed, stress free, and at peace with the world. This holistic and natural treatment draws on the wisdom of ancient Indian Ayurvedic (‘Science of life’) knowledge and combines the benefits of other tried and trusted therapies such as energy balancing, Swedish massage, acupressure, lymphatic drainage, head massage and yoga. During the massage, no products will be used on your skin, only the hands of a skilled therapist. You will lye on a massage table for an hour receiving a gentle and lovely massage, which will lead you to profound relaxation. After half an hour, the therapist might show you the results in half of your face and you will notice a difference already (this might happen only in the first session). The gentle massage movements and acupressure points are combined with health advice. The face is full of muscles and like any other part of the body needs to be exercised. The practitioner will suggest to you tips and advice about different facial exercises, natural beauty treatments, healthy eating habits and stress free life-style which complement the lasting effects of the massage, giving you participation and control of your rejuvenation process. The treatment works immediately giving you a natural glowing look for days, you will look radiant in just one session, people might tell you how healthy and fresh your complexion looks. Your cheeks will look lifted and your eyes brighter, open and alert, under-eye bags and puffiness will be reduced too. But it is useful to know in advance, that for long-term results, a series of six to eight weekly treatments is recommended. This is because although one session will begin to lessen wrinkles and habitual expression lines, tighten facial contours and improve skin tone, regular sessions have a cumulative effect. Massage works directly on your skin, muscles, nervous system, circulatory and lymphatic systems, as it does re-balancing your subtle energy field, more than any surgery treatment can ever do for you.